Farm buildings in an area of German settlement, near Nova Petrópolis. Grape vines covering hillsides near Bento Gonçalves. Just over 100 kilometres north of the Brazilian city of Porto Alegre lies the old colonial zone of Rio Grande do Sul, the country’s southern-most state. At the start of the 19th century, the state was frontier territory, land that the newly independent Brazil was keen to protect from possible Argentine encroachment. Rio Grande do Sul is covered by two main eco-regions: pampas grasslands in the south and hilly, even mountainous, territory in the north. 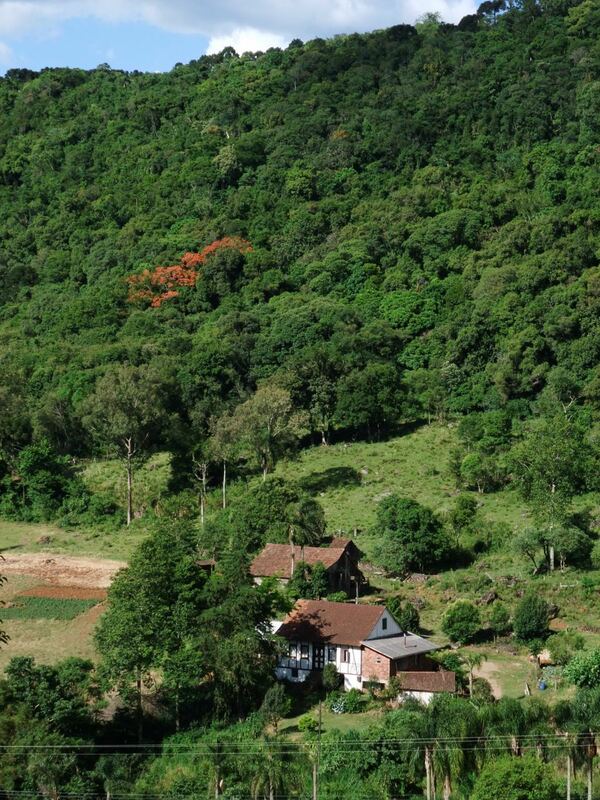 The densely forest-covered mountains were entirely unsuited to the kind of plantation-based agriculture, worked by slave labour, that dominated tropical Brazil to the north. As such, in the early 19th century it was recognised that if this new land was to be exploited, an alternative settlement pattern was required. Rio Grande do Sul was promoted by Brazilian immigration agents as being an ideal destination for land-hungry Europeans, in particularly for Germans and Italians, seeking to establish independent family farms. Germans first arrived in 1824, initially taking land to the immediate north of Porto Alegre. Most of these immigrants came from the mountains and valleys of the Rhineland-Palatinate region of the Hunsrück, its landscape remarkably similar to that of the Serra Gaúcha– the mountains of Rio Grande do Sul. This would remain an important destination until the late 1850s when most German states banned emigration to Brazil after news filtered back home of dreadful treatment of immigrant sharecroppers in the coffee-growing regions of São Paulo. Agents then turned their attention elsewhere in Europe and between 1875 and 1915 it was the hills and mountains of Veneto, in northeast Italy, that became the main sources of immigrants. These Venetians settled to the north of where the Germans had established themselves, taking land that was even more challenging to cultivate. Whereas Germans concentrated on mixed farming to supply the needs of Porto Alegre’s growing population, the Italians focussed on growing grapes and producing wine, using knowledge and skills that they had brought with them from Europe. It is now almost two hundred years since the arrival of the first German immigrants in Rio Grande do Sul and just over one hundred years since the end of the wave of Italian immigration. Because the immigrants were concentrated in ethnically homogeneous groups, in what until quite recently have been relatively isolated areas, to this day German and Italian cultural traditions – including languages – remain strong, especially in the rural areas and villages. “Riograndenser Hunsrückisch” gradually developed, a language based on the German immigrants’ Hunsrückisch dialect, elements of other German dialects and the inputs of Portuguese vocabulary and grammar. With the arrival of Italian immigrants, “Talian” slowly emerged as a dialect based on the Venetian language. During the course of the 20th century the linguistic presence of German and Italian appeared to be fading fast, but in recent decades the status of Riograndenser Hunsrückisch and Talian has improved with the languages receiving official recognition at a local level and even being taught in some public schools. With a temperate climate of relatively cool winters and very warm summers, a European heritage and a picturesque landscape, many Brazilians view Rio Grande do Sul’s Serra Gaúcha as being an exotic contrast to the country’s imagined mainstream. Local tourist officials promote a folksy image, that of German-style bands pumping out merry “umpapa” tunes, enormous high teas (“café colonial“), Christmas markets and grape, wine and polenta festivals. Although this isn’t entirely a fabrication, realities are far more complex. 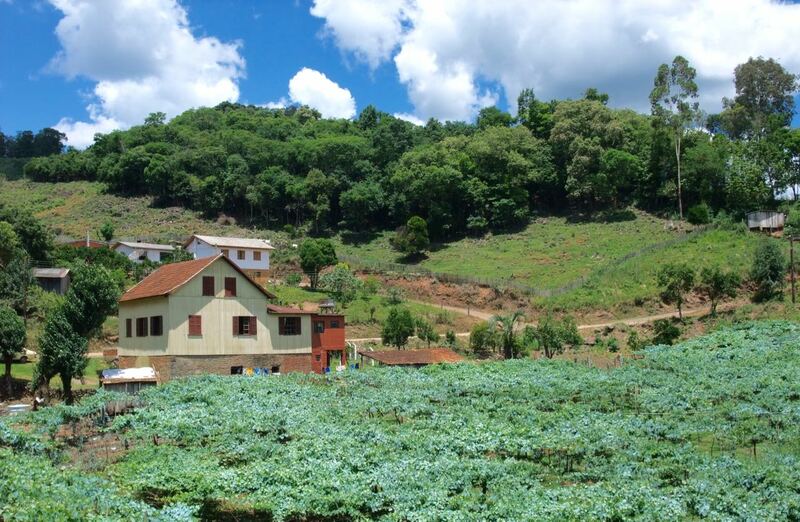 The rural inhabitants of the Serra Gaúcha have long faced similar problems to those experienced by smallholders elsewhere in Brazil, most notably fitting in with an agrarian system that has always favoured large producers. Here, some farmers have managed to integrate themselves with the agri-industrial complex by supplying grapes to large wine producers or contracted by corporations to produce chickens, pigs, milk or tobacco. While these ties may guarantee some security, the control of production is lost and sales to third parties (and possibly achieving higher prices) are not permitted. 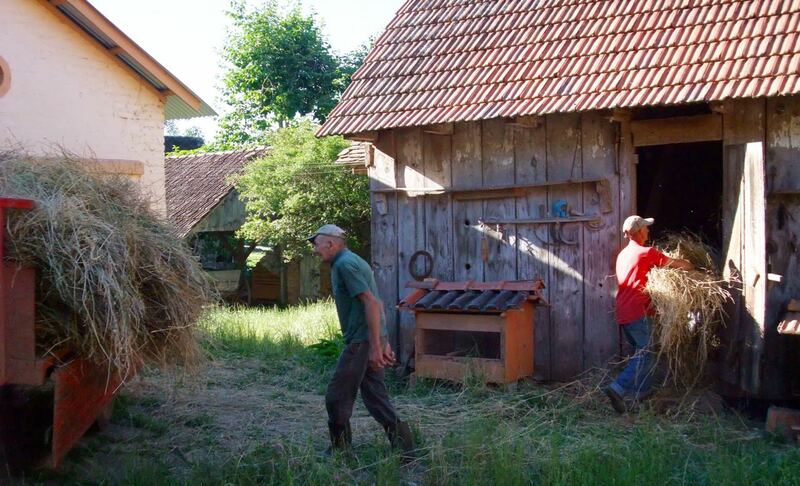 As in many parts of modern western Europe, small-scale producers have had to find ways to supplement their farming incomes. Many take on part-time employment in factories or in agricultural processing plants. 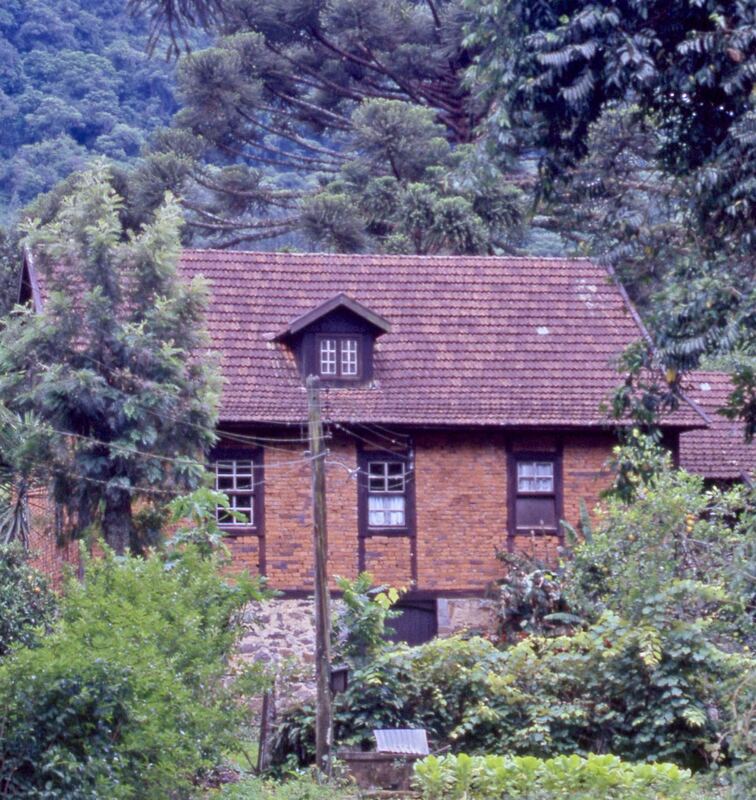 Some manage to involve themselves with tourism, perhaps producing jams and cakes, renting our rooms or dressing up to receive day visitors to their farms. Another survival strategy has been to sell up entirely and move to where land is much cheaper, including to the far-off Amazon. Still, if you can see beyond the kitsch representation of the region’s German and Italian heritage, as well as past the very real contemporary struggles of the inhabitants, the Serra Gaúcha certainly has much to offer visitors. The landscape is dramatic, backroads lead to little-visited villages and farms where the inhabitants seem genuinely pleased to share with outsiders stories of their immigrant forebears and to talk about today’s way of life. And the cakes are usually excellent and, if you’re in the right mood, the wine is just about drinkable! Land holdings are usually small and the hilly – in places mountainous – terrain imposes barriers to cultivation. 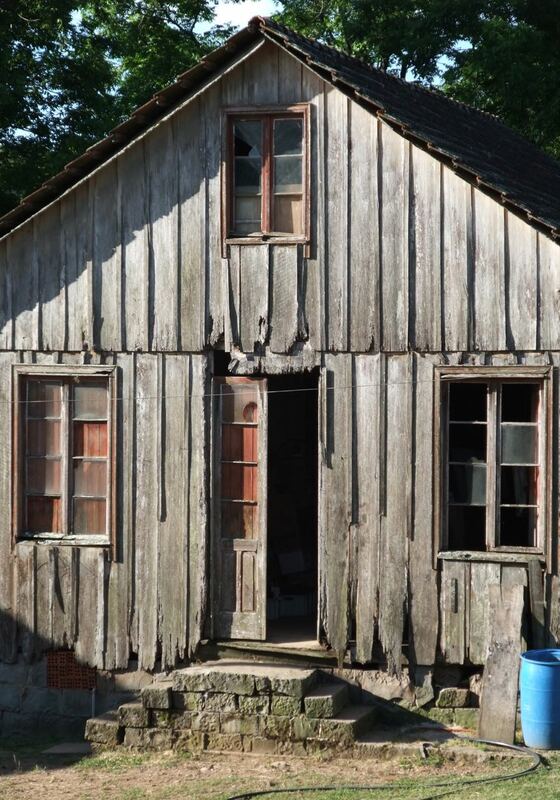 German settlers introduced architectural styles from home, most notably half-timbered buildings (“Fachwerkhäuser”). 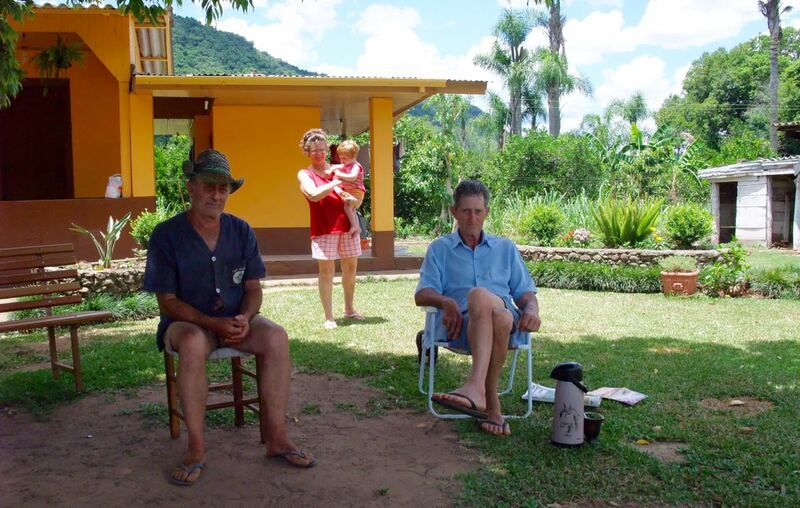 A family enjoying a chimarrão (erva-mate) break. 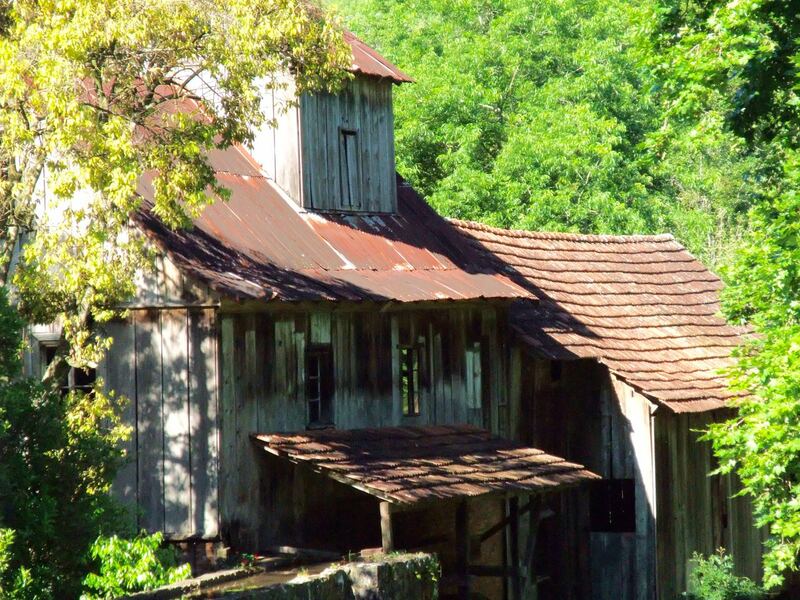 An abandoned sawmill near Nova Petrópolis. 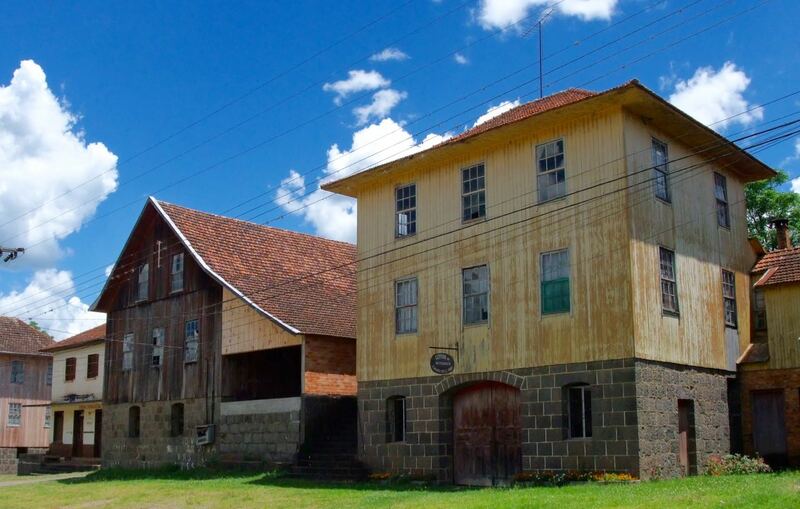 A 19th century farmhouse on the Nova Petrópolis to Gramado road. Vale do Quilombo, near Gramado. 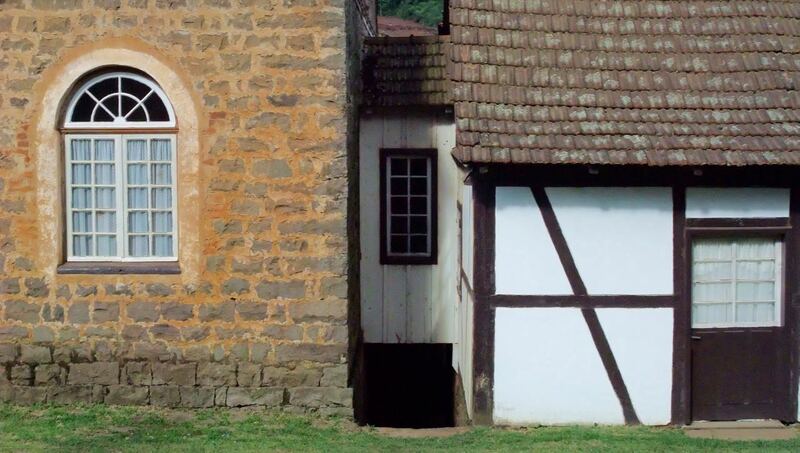 “Fachwerk” (timber-frame) was the main construction method in the German areas, but builders used stone. Established by immigrants from Bohemia, this complex in Nove Colônias has had various uses including as a general store and as a dancehall. 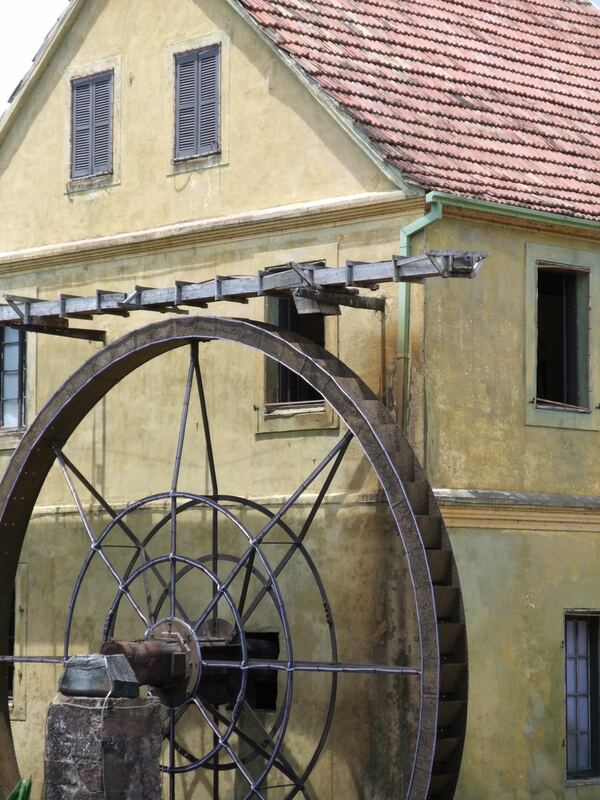 Water-powered mill at Picada Café. 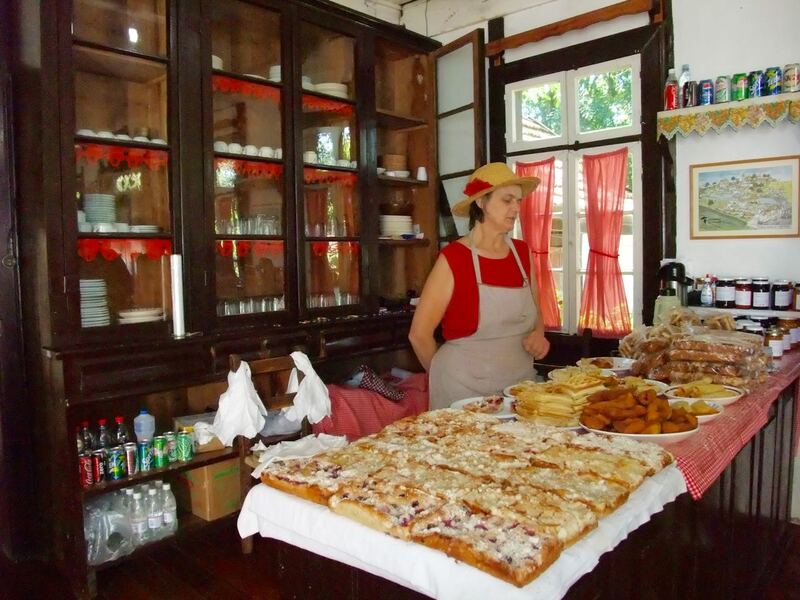 Tourism has become a vital income generator for many farmers, such as these in Nove Colônias. When they receive visitors, the owners of the Recanto dos Pioneiros adopt an imagined version of the dress of their German ancestors. Farmers often struggle to survive simply from the agricultural output of their properties. To supplement their income, many take jobs away from their farms. Others have sold up and purchased much cheaper land in other parts of Rio Grande do Sul, western Santa Catarina or in the Amazon region. 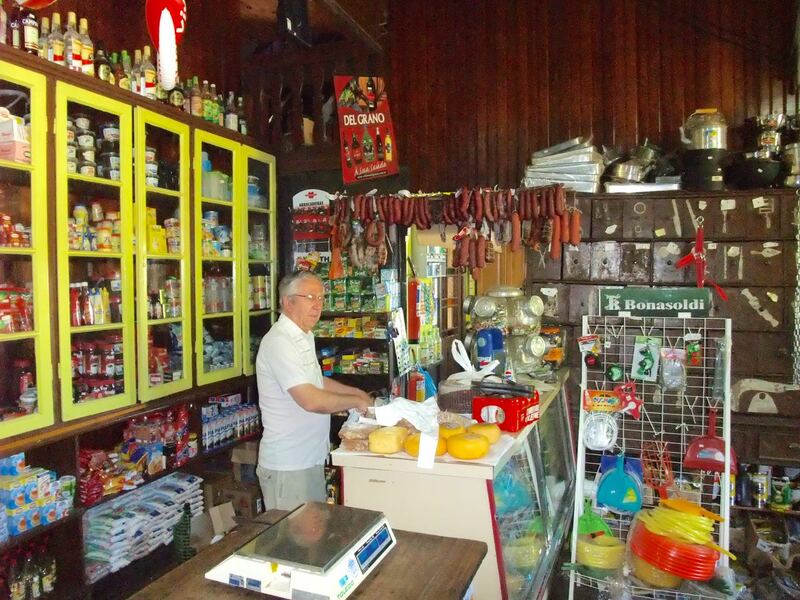 The “Casa Wazlawick” general store on Linha Imperial, near Nova Petrópolis. 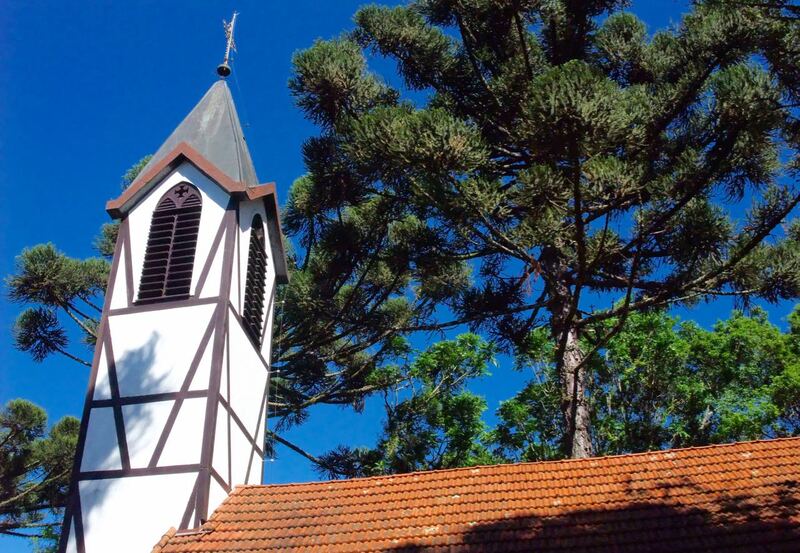 The Lutheran church in the Parque Aldeia do Imigrante. 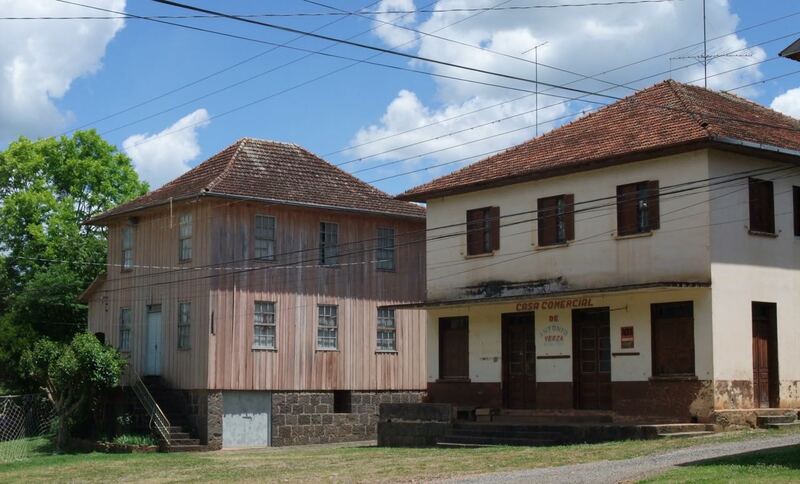 Abandoned buildings and relics of German immigrants from outlying districts of Nova Petrópolis have been brought together to form an approximation of a 19th century village. 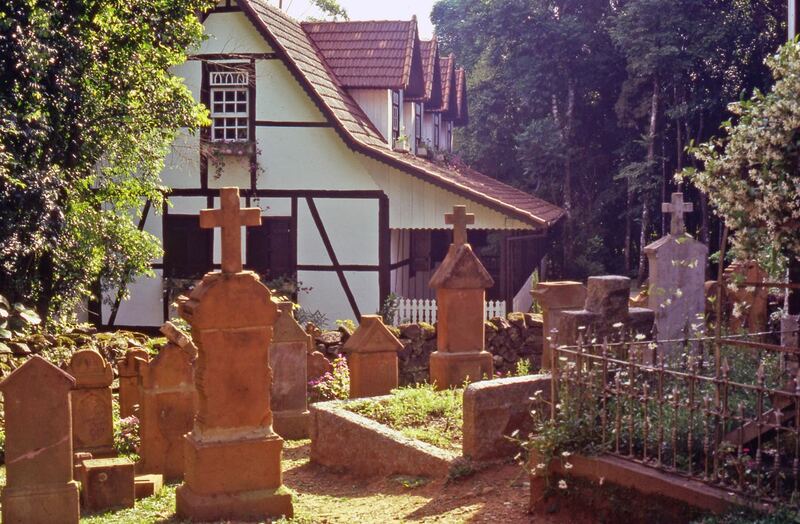 The cemetery in the Parque Aldeia do Imigrante in Nova Petrópolis. In the Parque Aldeia do Imigrante. 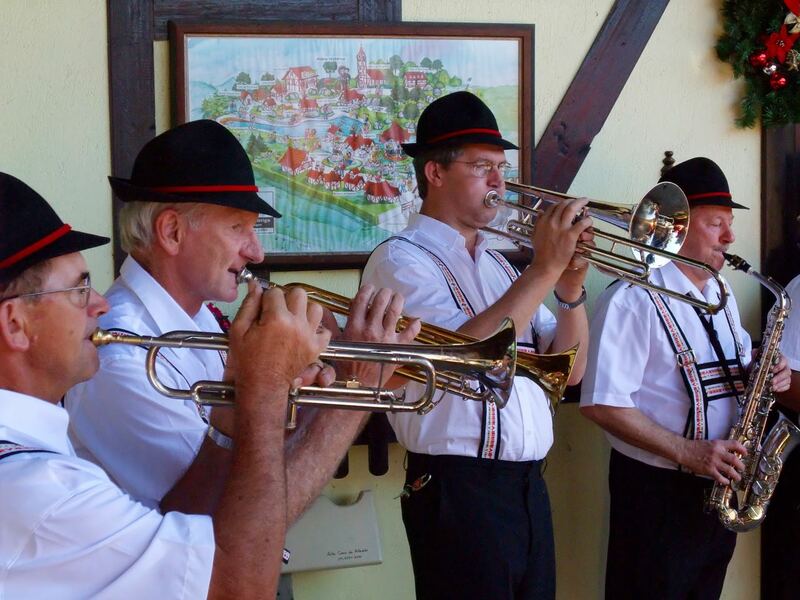 German-style bands are popular tourist attractions, but they also perform at events aimed at locals. Distrito 21 de Abril, Antônio Prado. 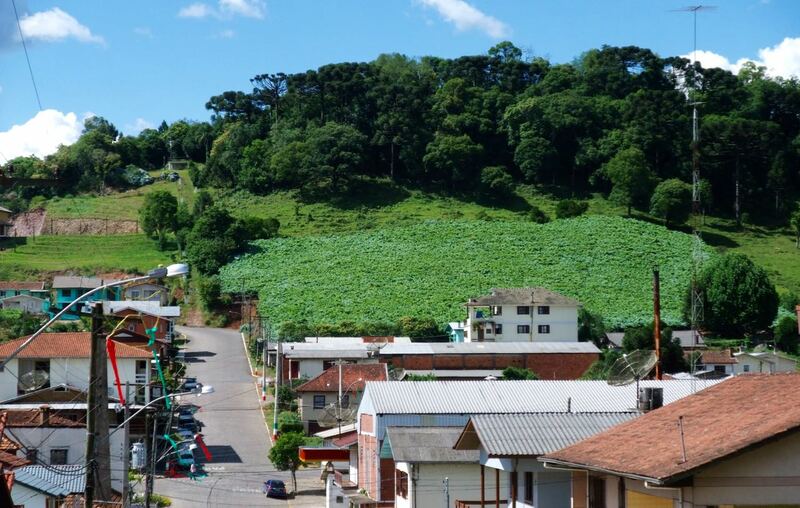 The town and outlying districts of Antônio Prado are noted for their high concentration of buildings that date back to the arrival of the Italian immigrants. Distrito 21 de Abril, Antônio Prado. 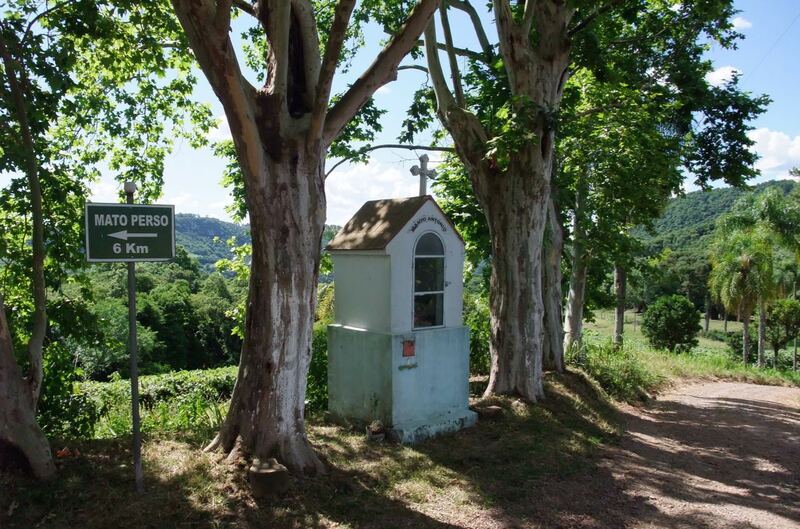 Villages such as Otávio Rocha, near Flores da Cunha, are completely surrounded by vineyards. Near the village of Otávio Rocha. Along the Estrada do Vinho in the Vale dos Vinhedos, near Bento Gonçalves. One of the many wine producers in the Vale dos Vinhedos, near Bento Gonçalves. Very interesting article. I’ve seen mentions of German immigration to Chile after the 1848 revolutions, and I think there are some pockets of Mennonites, etc. in Mexico, but never read anything before about Brazil. My father’s family immigrated to Pennsylvania from the Palatinate — and I’m sure “Riograndenser Hunsrückisch” has a few words in common with “Pennsylvania Deitsch.” I’ll be going to Chile in a few months, don’t know what region yet, and will keep my eyes peeled/ears open for German influences there. Enjoyed the photos, too. Google “Blumenau” and “Pomerode”. The german culture is very strong here in Southern Brazil. Thanks for your comment, Francisco! I’ve been several times to both Blumenau and Pomerode. 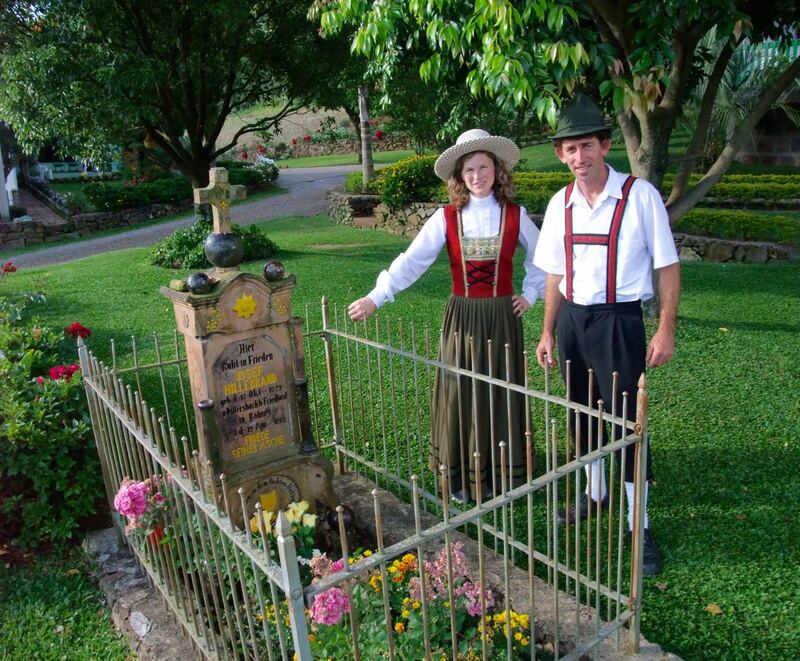 Blumenau is a bit Disney-like, but Pomerode is a fascinating for how German culture managed to survive and evolve. Thank you for your nice comment! 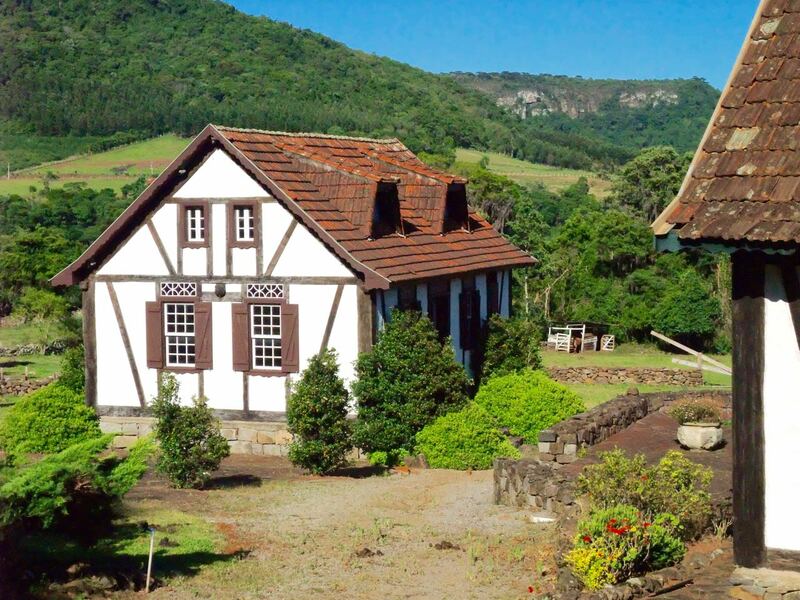 Apart from in Rio Grande do Sul, the German language (or German dialects) and German culture (or variants) remains very much alive in various other parts of Brazil. 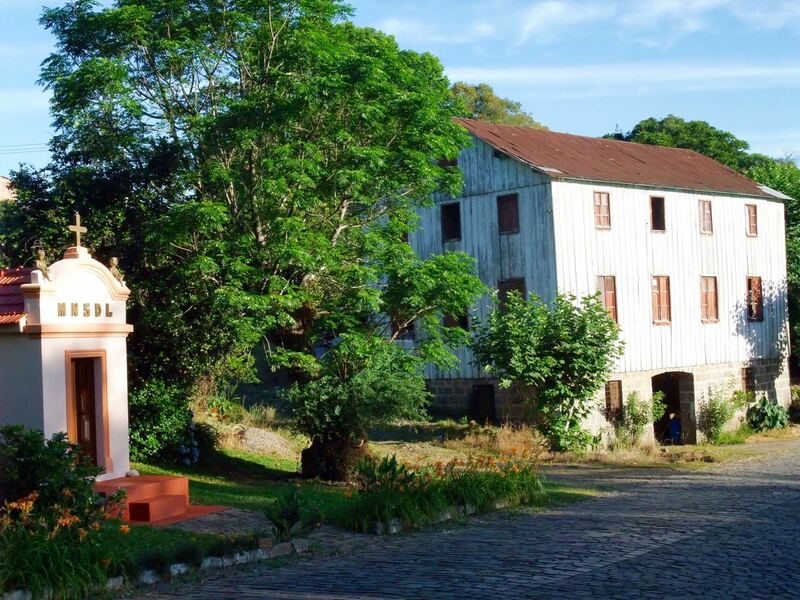 I might sometime produce a blog post on Pomerode, in neighbouring Santa Catarina, a place that promotes itself as “the most German city in Brazil. (In reality it’s little more than a village but it is true that German is universally spoken both there and in the surrounding countryside.) I’ve also visited German communities in the state of Espirito Santo – the Brazil of the tropics where they really do seem out of place! I hope that you make it to southern Chile, the main region of German settlement. And If you do get there, I hope that you produce some articles for your blog. Wearing lederhosen in that climate has got to require a whole lot of talcum powder, although perhaps it encourages yodeling. Very good text about southern Brazil. But, in order to make justice, the wine region has award-winning wines. Of course, you have to find at right places. Regards….. Thank you for your kind comment. 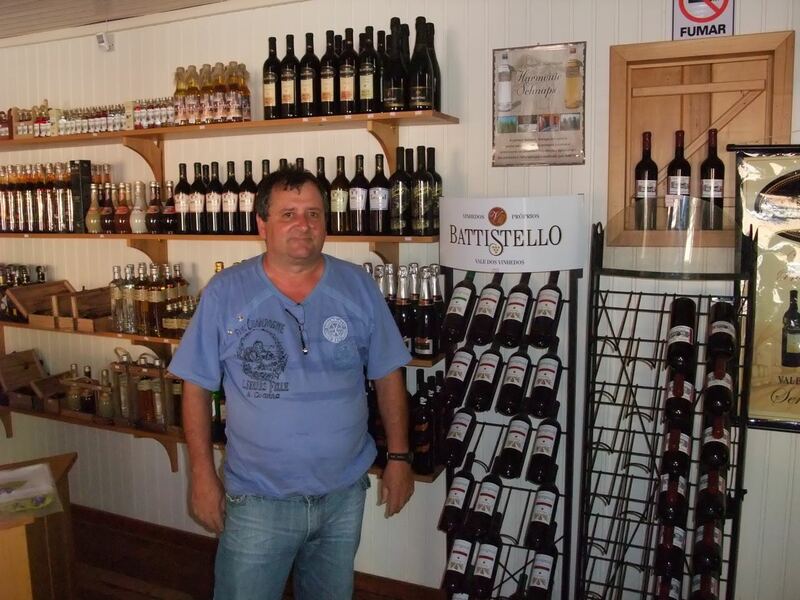 Yes, my generalisation about the quality of the local wines is probably unfair as they certainly do vary in quality. I know that sparkling wines, in particular, are often good or even very good. But my experience is that the “best” (non-sparkling) wine from the Vale Vinhedos remains no match to even mediocre Argentine wines. I only recall tasting one truly superb Brazilian wine – and it wasn’t in Rio Grande do Sul but a wine produced by Villa Francioni, near São Joaquim, in the highlands of Santa Catarina. But I must return to to Rio Grande do Sul and try again…..